Today, I am going to share a fun card with you that I found a template for online. It's a snow globe card. Who can resist a snow globe. You know you just have to pick it up and shake it to see the snowy world inside come to life. This card has that feel. Using the template, just cut the shape on a folded piece of heavy white card stock. Then cut the base from designer paper of your choice. A circle for the globe part. I used a Spellbinders circle for mine. I used sparkly white embossing powder for the snow. Acetate to look like glass. Inked around the edges with Broken China distress ink. then run through a holly branch Cuttlebug folder. (love this effect) Red sparkly ribbon attached. The inside sentiment on both cards is "I wish we could spend Christmas together"
These are quick, really cute cards. The globe can be stamped with whatever is your favorite Christmas stamp. Kids would love these too! Hope you have time to try this little card. 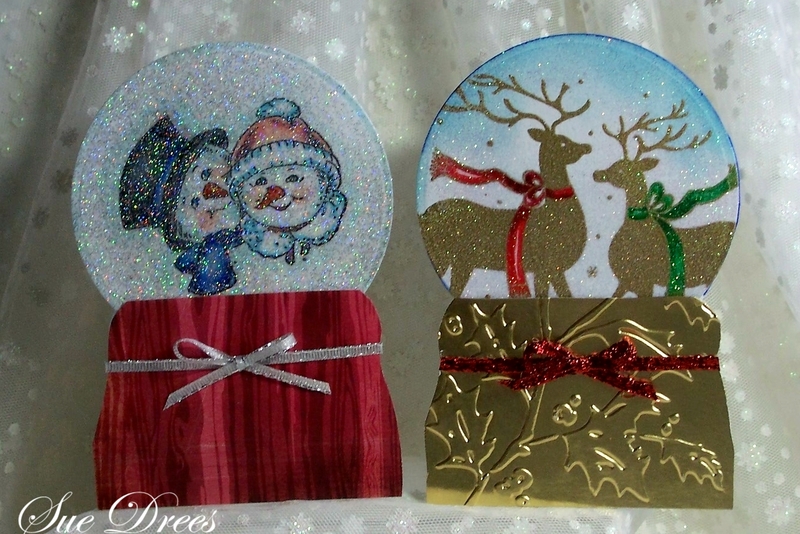 two fantastic snowglobes Sue, beautiful made. 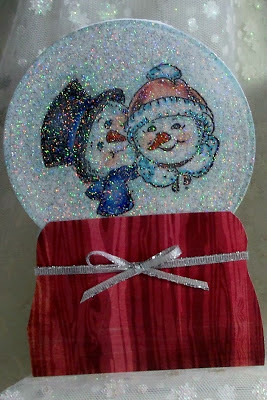 These are fantastic snow globes, I love all the sparkle. Oh, Snow globes are just beautiful and so are these. You did such a wonderful job. I'm going to have to see if I can come up with one. Thanks for the instructions. Have a great day. Oh Sue, these are fabulous...I have to try them! My granddaughters love snow globes. 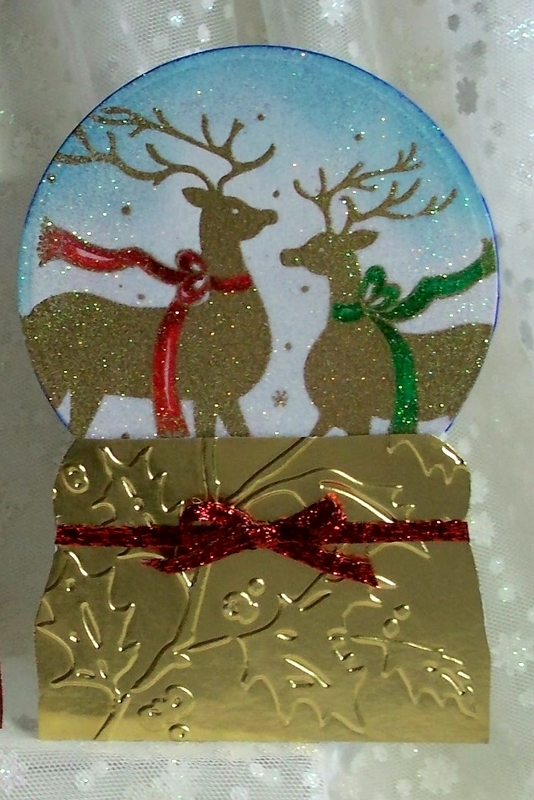 Love the gold base on the one with the deer. I spent all day yesterday making cards so I am just about finished...now to get them written & mailed out! 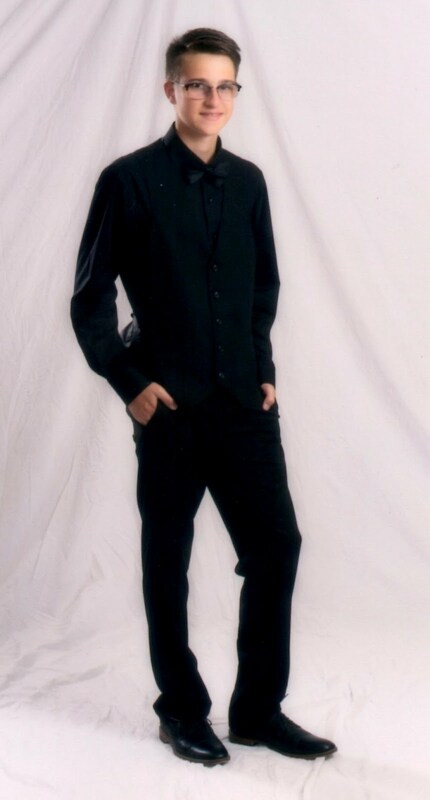 Oh my gosh Sue!! I just LOVE these gorgeous snow globes!! WOW!! Two fabulous snow globes, very festive and sparkly and love both images! Love snow globes at Christmas. They just keep the magic flowing.